Thinking About Going to See a Doctor? Going to a doctor’s appointment can be very intimidating and sometimes a bit scary, especially if you’re seeing a new doctor. As a registered nurse in the Cleveland Clinic Women’s Health Institute, I have seen individuals both male and female who are afraid to visit a doctor, delay making an appointment because of fear, forget what they want to ask once they are in the exam room and leave the visit with more questions than they came with. Below are tips to help you make the most of your doctor’s appointment starting with scheduling the appointment to what you should do when you get home from an appointment. Mention if you are a new patient, so they can get all of your information. Tell the scheduler if you need a physical exam. Mention if you have a sore back, sore throat, etc. Describe all of your symptoms, so a specific amount of time can be set aside for you. Does your doctor’s age match yours? 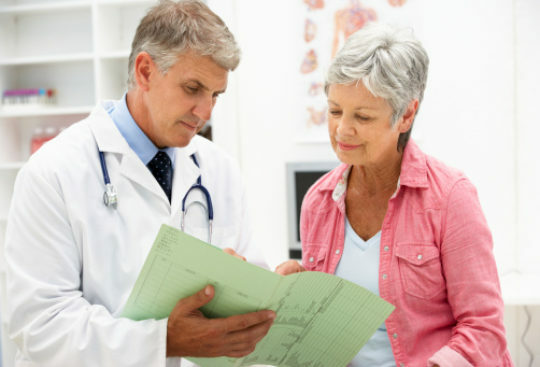 Long-term medical conditions like high blood pressure, diabetes or cancer require lifelong care. Select a doctor who will be there for you over an extended period of time. Always include any over-the-counter medications, vitamins and herbal products that you are taking. Your physician’s office will want to know if you have had surgery in the past. If you have, share what type and when. For example: Gallbladder-1975 or Total Hysterectomy-1989. Make sure to also include medical history such as heart disease, diabetes, thyroid problems, cancer treatment, etc. Some of the information that doctors need is the same, but other information may differ depending on the type of doctor you are seeing. Doctors usually have an average of 15 minutes per patient visit, so the better prepared you are with information helps the doctor use the time with you to diagnose and discuss any questions or concerns you have. Be honest while talking to your doctor. Don’t hold back any information even if you might consider it embarrassing. The more information you share, the better the doctor will be able to figure out what’s wrong and how to treat you. Lack of communication is a primary reason for patient dissatisfaction. Do you feel your doctor was thorough? Make sure your doctor gives careful attention to detail without rushing through an evaluation. Is your doctor caring & compassionate? Health questions can be confusing and frightening. Does your doctor respond with patience and kindness? Your doctor should talk to you, not at you. Q: What makes it worse or better? After Talking to the Doctor, What’s Next? How long do I take the medication?